This was the app you mentioned briefly at the end of your last post, right? Ooh! Shiny! Wait… that looks similar to the app from the last post. Very observant! Sometimes, the Microsofties understand this concept called consistency. It’ll work wonders here. Okay…. let’s go on an adventure. Let’s say I want to see some ASP.NET stuff. All the data… what do I see? 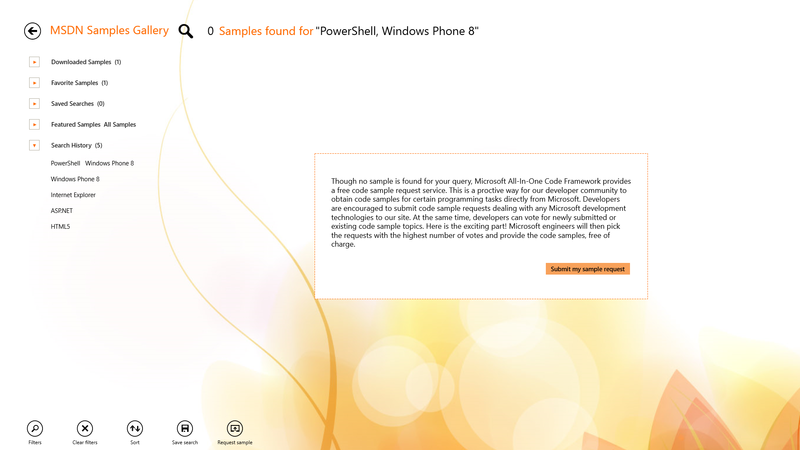 Okay… so I clicked the Download button, as I want to have the C# sample on hand. Did you notice that the button changed to browse? 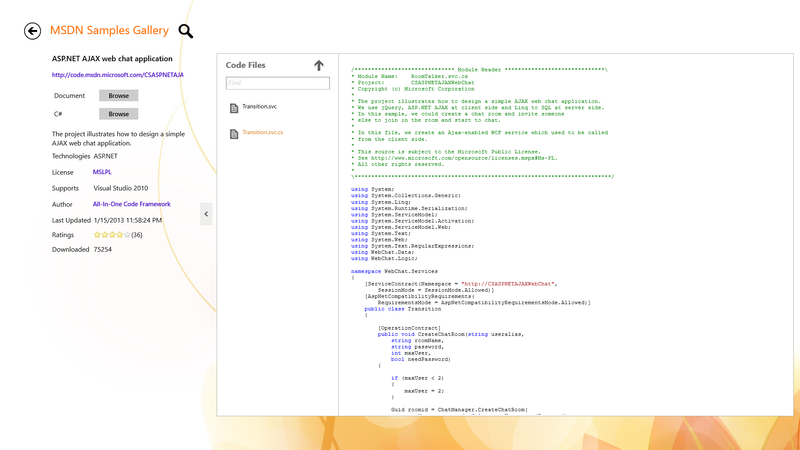 Now, you have this helpful code browser at your finger tips. Navigate through the C# code and check out the syntax highlighting. You can also select code and copy it to the clipboard, much like copy and paste in a lot of Metro Windows Store apps. What if I don’t want to download the code but want to bookmark this code for later? Come on, now! This is a Microsoft product, which means “bookmarks” are out and “favorites” are in! Right click in the code area to bring up the context menu bar at the bottom. Then, click the Add Favorite button. Okay… I downloaded this code. I favorited this code. I like the syntax highlighting. But how can I easily find my downloaded code or even my favorited samples? If you go to the search screen, you’ll notice some categories at the top, including Downloaded Samples and Favorite Samples. You’ve shown us what happens when there are results. What if there aren’t any results? So… how did you hear about this again? The benefits of being an MVP and finding out cool things that we’re actually allowed to talk about! 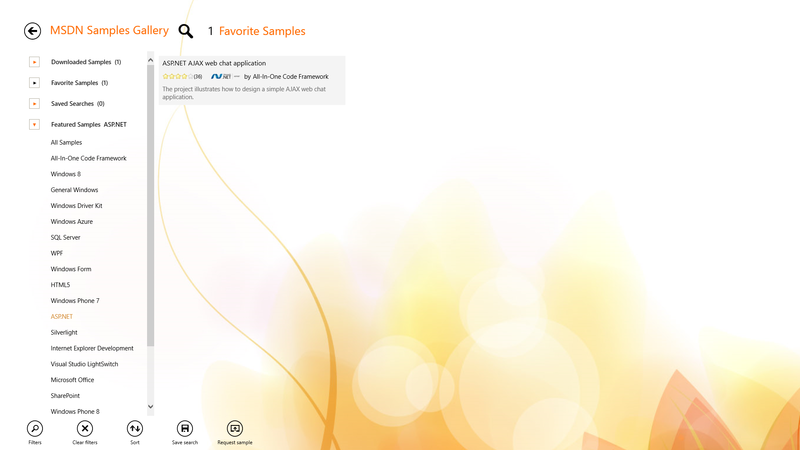 Now, if you’re on Windows 8 – go get the Sample Browser app! If you’re on Windows 7, see my last post on how to get their app!